Passing the St. Rose Torch! This past week, besides the normal busy schedule of manager’s meetings, research for assignments and attending stimulating events with my boss; I had the pleasure of meeting my colleague, Wendy’s nephew, who is an incoming freshman this fall! Jamaal Greenwood is his name and he will arrive at The College of Saint Rose on a basketball scholarship, how exciting! He came to me with a list of questions about his academic aspirations and how Saint Rose would accommodate. It was refreshing to meet someone so accomplished and with an idea of where he is headed. I was thrilled to share my personal stories with Jamaal and share all the experiences Saint Rose has to offer. 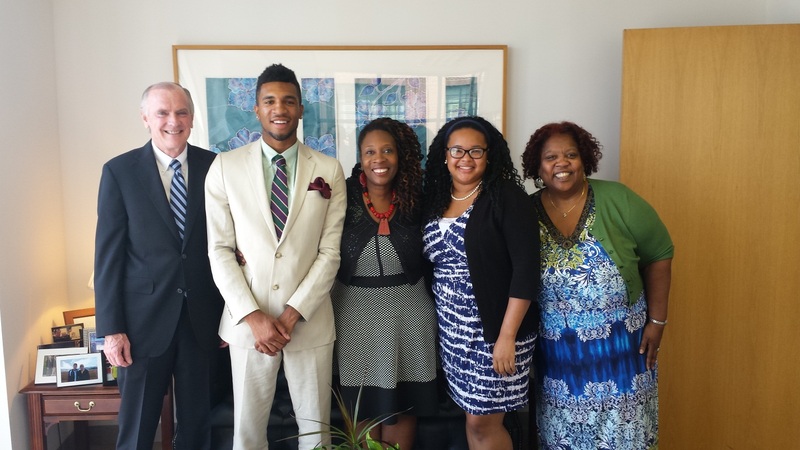 Jim, President of Legal Services Corporation, also took the time to meet with Jamaal and his mother Kim with any questions they might have had. This is a habit of Jim, taking the time to make time for others. In all, I think Jamaal and his mother definitely walked away knowing he made the right decision for an undergraduate education. I wish you nothing but the best Jamaal and you have my business card (this is now a habit of mine), so don’t be a stranger. Our meet and greet got me thinking about how far I have come prior to and post-Saint Rose education. It was such a journey that I’d like to share it all with you, in tomorrow’s blog post. Hope you all enjoy! Tags:admissions Albany NY alumni blog college of saint rose college student freshmen internship legal services corporation LSC men's basketball project 70 saint rose Washington D.C.